A fresh batch of Amarnath pilgrims, including women and Sadhus, left Jammu early this morning for Baltal and Nunwan base camps in Kashmir. SRINAGAR: About 11,000 pilgrims on Tuesday left Baltal and Nunwan Pahalgam base camps for the holy Amarnath cave shrine in south Kashmir Himalayas. Over 1,04,000 pilgrims have paid obeisance at the holy cave. 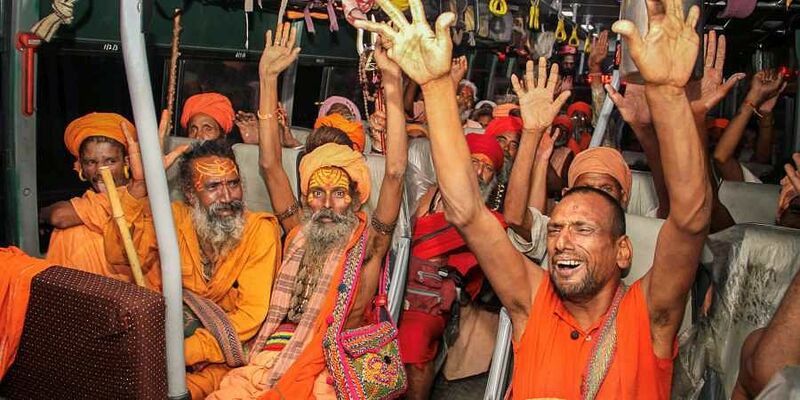 A fresh batch of pilgrims, including women and Sadhus, left Jammu early this morning for Baltal and Nunwan base camps in Kashmir. The pilgrimage was going on smoothly though it was affected due to landslides and slippery track conditions following rain. Official said that 9,609 pilgrims on Monday paid obeisance on the 12th day of 60-day-long annual pilgrimage to holy shrine till last night. The pilgrims, who had night halt at different halting stations, are reaching the cave shrine to pay obeisance since early Tuesday morning, the official added. Over 5,000 pilgrims, including women and sadhus, who had arrived from Jammu on Monday, left Nunwan Pahalgam base camp early this morning for Chandanwari, the last motorable halting station on traditional yatra route. Meanwhile, pilgrims, who had a night halt at Chandanwari and other halting stations, also left for holy cave early this morning, the official told UNI. They said about 6,000 pilgrims also left Baltal base camp for the holy cave early this morning. The pilgrims are scheduled to reach the cave shrine in the afternoon after covering the 14-km-long hilly shortest track. Majority of the pilgrims, who had night halt in the camp near cave shrine after paying obeisance, have also started their return journey to base camp.